I love Wegmans. For those of you who unfortunately don’t have a location near you, Wegmans is an awesome grocery store chain that was started about an hour away from me in the Rochester, NY area. Not only does it offer wonderful clean stores, great staff, a terrific selection of products, quality store brand items and a delicious prepared food section, but it also has a great selection of recipes online. 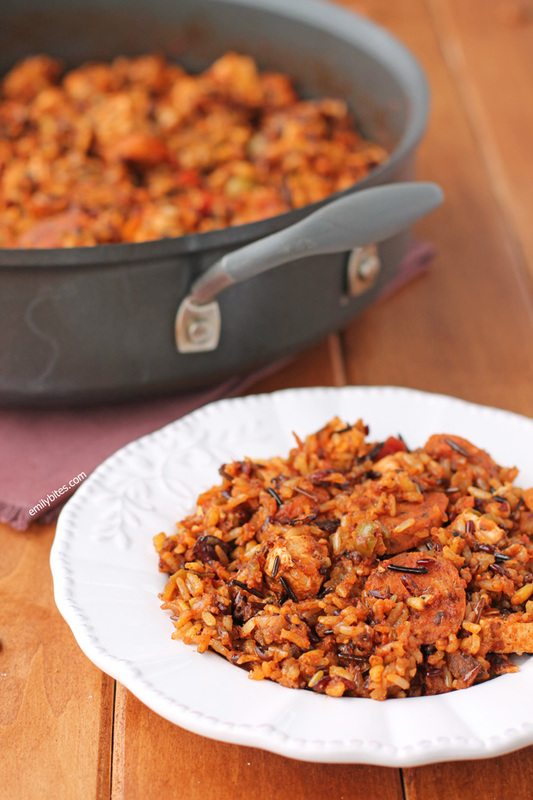 This Chicken and Chorizo Salsa Skillet recipe was one I discovered on the Wegmans web site (with a few tweaks of my own), and I’m so excited to share it with you because it’s absolutely delicious. 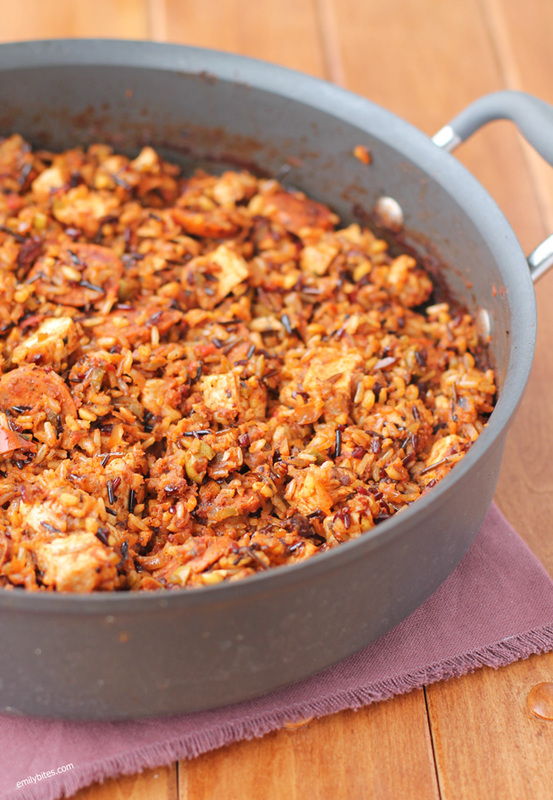 This Chicken and Chorizo Salsa Skillet is a one-pot meal (yay for less dishes!) that you could easily make for a crave-worthy weeknight dinner. It’s so incredibly flavorful and hearty, I am positive that once you try this it’s going to be added to your regular meal rotation. If you are hesitant about the olives in any way, trust me – use them! They’re a nice briny surprise every time you get one. I found this very filling and the moment I tasted it I knew (a) my husband would love this and (b) we’d be making this often. I think you’ll feel the same way! Pre-heat the oven to 400. In a large, oven-safe skillet, saute pan or Dutch oven, bring a teaspoon of the olive oil over med-high heat. Add the sliced sausage and stir to coat with oil. Cook for 2-3 minutes, stirring occasionally until sausage has browned a bit on both sides. Remove sausage to a side plate. Add the remaining 2 teaspoons of oil to the pan and add the diced onion. Stir to coat and spread to cook for 3-4 minutes until onions begin to get tender. Add the minced garlic and the uncooked rice to the pan and stir to combine. Cook for an additional 3-4 minutes, stirring occasionally until rice is toasted. Carefully add the water, salsa and reserved sausage to the pan and stir together thoroughly. Cover the pan with a lid and bring to a bubbly simmer over high heat. Place the covered pan into the oven and bake for 25 minutes. Remove pan and sprinkle the chicken and olives over the top of the skillet mixture. Re-cover and place the pan back into the oven for another 10 minutes. Remove pan from the oven and allow it to sit covered for 10 additional minutes. Stir chicken and olives into the mixture until well combined and then serve. We are practically neighbors – I live in Rochester and love Wegmans also! In addition to running the best supermarkets ever, they are great community members. Wegmans is so supportive of communities in which they do business. Great company! This recipe sounds amazing – I’m going to give it a try. Love your blog! Yay, howdy neighbor from a Buffalo girl! :). I hope you love the recipe! I’m basically at Wegmans every day, haha. Do you think leftovers will freeze well? It’s just me, and I’d love to freeze individual portions for future meals, especially work-day lunches! Looks amazing! I almost never freeze food after I’ve made it, so unfortunately I’m not an expert at what freezes well. :/ If you try freezing it, please report back! Maybe try adding some fresh herbs to your dish, the food just looks brown and not very tasty. Thanks Becca :). AGREED. I’m glad you loved it! Had the hubby make this for dinner tonight and it was ahhh-mazing! Even cooked on the stovetop it came out great. Husband desperately wanted another bowl, but he was too full – good thing for leftovers! I’m so happy it was a hit, Susan! I checked my local store today and couldn’t find the al fresco chorizo. I just tried the store located and no one within 50 miles carries this flavor! Do you think that the al fresco andouille sausage would be a good substitute? Sure, Andouille would probably be delicious! I just made this tonight and it’s really good! I subbed Andouille chicken sausage (couldn’t find chorizo) and thought it worked well. Definitely don’t skip the olives! Agreed, the olives are awesome! I’m happy you liked it! Hi Emily- I made this and loved the flavors. However, my rice was undercooked and still crunchy. I increased the time by 10 minutes. 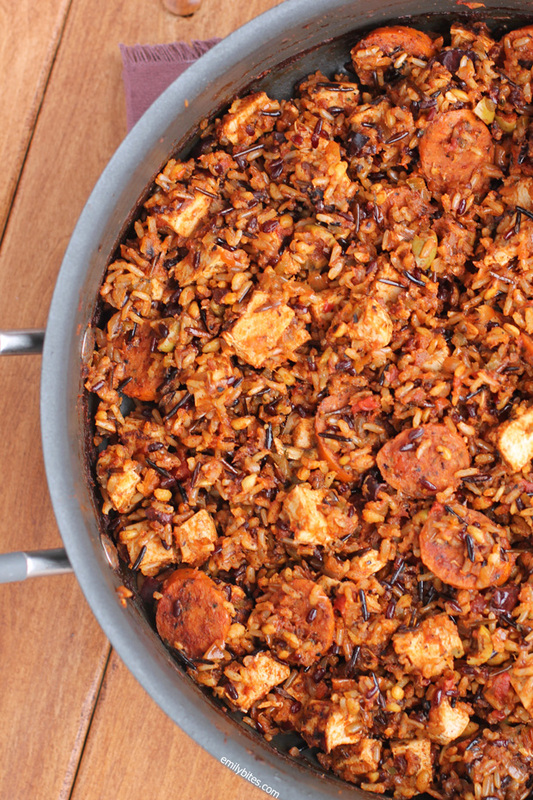 What do you think about cooking the rice partially before adding it to the skillet? If I did that, how would you adjust the liquids in this recipe? Thanks! Sure, I think you could do that. I haven’t tried doing it, so I can’t say for sure on quantities but you could probably play around with using less water. Let me know if you try it out! I’m looking forward to trying this tonight! I don’t know how I would eat without your website! Delicious flavor, but I also had crunchy rice. Followed the recipe exactly…. Added chicken stock to finish cooking rice. Sorry to hear about the rice – I’ll have to go back to this one and see if I can figure out why that’s happening for people. Glad to hear the flavors were on point! This was SO good!! Really different from the normal flavors I eat and I loved it. I also couldn’t find chicken chorizo at my grocery store so I used Johnsonville Chipotle Jack sausages, and got the same points. My rice cooked great. Definitely a repeat recipe! I couldn’t find chicken chorizo either, even at Wegmans. So I used Wegman’s brand lime chipotle chicken sausage. Still very yummy. My rice cooked fine, too. Can you share what measurement the 8oz of the rice blend in cups? Just made this yesterday– IT IS SO GOOD!! I just heated it up for lunch at work and everyone is asking, “What is that, it smells delicious!” So I’ve been sending out your recipe. It’s so so tasty and filling and I will definitely be making it again! My friend and I made this together last night and it was amazing! Though I am not from upstate NY, we have Wegmans where I live in NJ, and I go out of my way to shop there over all the other area choices because it is so vastly superior. The only ingredient I couldn’t find was the chicken chorizo so I did end up using pork, and although I know that means extra calories, this is so good that I’m okay with it. It’s going to take a lot of willpower not to just eat all the leftovers by myself tonight! I’m definitely going to share this recipe with friends and family! Can you substitute another meat other than chicken?